I promise that I am getting to a week where I review only amazing graphic novel adaptations of classic literature. I say that because I do not want today’s title to be a tease, for it is an amazing adaptation of a beloved class Shakespeare play: Macbeth. It is First Second Week! Get excited, First Second publishes some of the most classroom friendly graphic novels out there. As a massive fan of Shakespeare…I think my Hamlet tattoo will attest to that, I LOVE a good graphic novel adaptation of Shakespeare’s work. I’ve actually reviewed this title before for one of my blog posts, so if you want to read what I thought a year and a half ago, click here. But as I’ve done with any of the books that might have made an appearance on my blog before this 365 quest, I will not re-read what I had written so as not to influence my 2017 self. But I will say that I was not writing nearly as frequently back then, so the posts were a bit longer, so while you will not get 2017 Eric in that old post…I can assure you that my hair is much more majestic now, you will find extra in-depth analysis of this title. I love this book. The idea of a collection of animals putting on a Shakespeare play after a zoo closes for the enjoyment of the other animals is a fantastic idea! 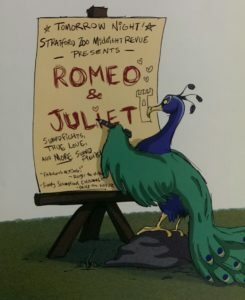 And while the language and some specifics are not exact to the original play, the Ian Lendler writes the heck out of this classic adaptation in order to give a new generation of readers a pathway into Shakespeare. The art is slick with colorful animals and large panels filling each page. Even when the colors are dark, colorist Alisa Harris splashes enough brighter color onto the page as to not frighten or put off younger or sensitive readers. I mean the blood is straight up ketchup. Like ketchup is a plot device. 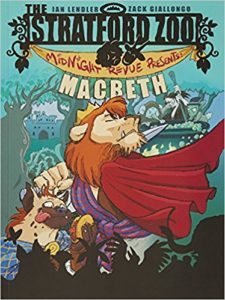 The book is perfect for beginners to Shakespeare as well as fans looking for a new spin on the classic tale. Pick it up and read it with the little ones at the crib or in the classroom. Don’t preach the legend of Shakespeare though! Not yet. Play it cool. Let the youngsters come to the Shakespeare is cool conclusion themselves. 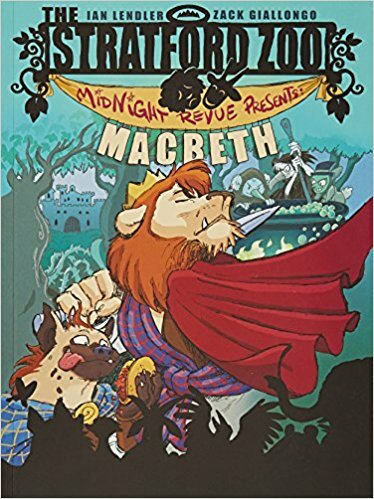 Good stories are good stories, and Macbeth is one of those outrageous tales that we will keep telling, and if young students can make a connection in their teen years to this awesome book that they read when they were younger, we will grow that Shakespeare readership. Is this a dagger which I see before me?? No, it’s my knife…and fork. I have to eat dinner and grade papers. Talk to y’all tomorrow.